Synapse has developed a tool to estimate states’ electric-sector costs and benefits of Section 111(d) of the Clean Air Act. The Excel-based tool, now available on the Synapse website, is based on EPA’s national estimates of implementing its four “building blocks” (learn more about the 111(d) building blocks by watching the Synapse webinar “Get to Know 111(d): Components and Implications of the Draft Rule for States” here). The tool was developed as part of Synapse’s ongoing work supporting clients in analyzing and drafting comments on the EPA rule. 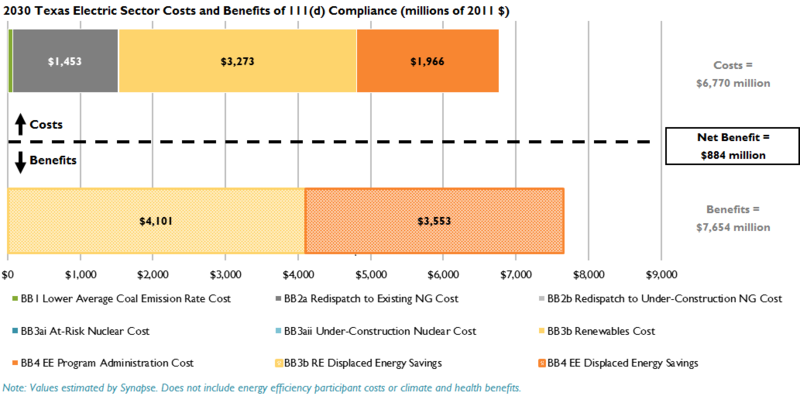 The example below presents Texas’ estimated electric-sector costs and benefits of 111(d) compliance for 2030. These results reflect Texas complying singly—EPA asserts that states complying jointly will have lower costs (and greater net benefits). The tool is free and easy to use; if you have questions about generating results for your state, please contact Elizabeth A. Stanton at eastanton@synapse-energy.com or Pat Knight at pknight@synapse-energy.com. Texas’ estimated electric-sector net benefits for 2030 are $884 million.